Did You Know Pizza is Actually Good for You? Pizza isn’t typically your first thought when you think of healthy food, but pizza can actually be good for you! It’s packed with vitamins and nutrients and since pizza is one of the most versatile foods available, there are ways that you can tailor it to any health need you may have. In general, pizza is loaded up with veggies and of course tomato sauce! Tomatoes have many health benefits such as improving vision, helping to manage diabetes, aiding in digestion, and providing a healthy dose of vitamin C. So, if you put a solid foundation of tomato sauce on your pizza and choose many different vegetables such as broccoli, bell peppers, spinach, olives, and mushrooms you will already be meeting your daily intake of vegetables just by eating a pizza! Another way to make pizza even healthier is by using alternative crusts. If you’re trying to cut back on gluten or carbs, you can make pizza crusts out of cauliflower or cheese! If cheese is the issue, try making your pizza without it and just loading up on the other toppings. You can also find low fat cheese available to put on your pizza. Just like with any food, eating pizza is about portion control when you’re trying to be healthy. It can be easy to sit down and devour a whole pizza by yourself, but a small portion is really all you need. 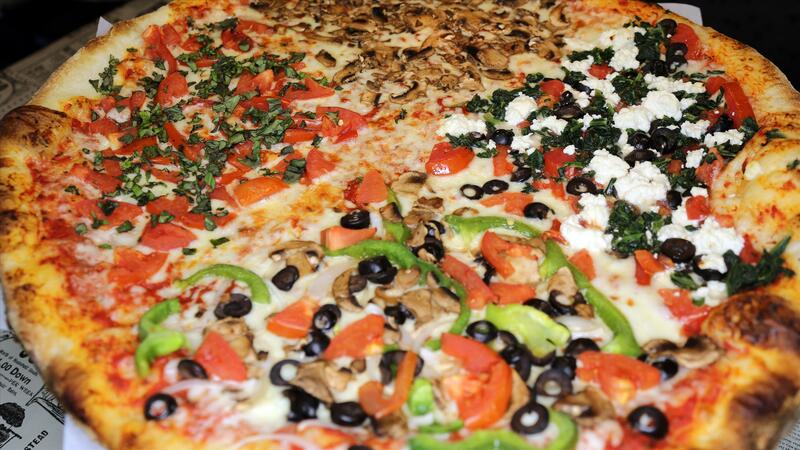 One or two slices of New York Style Pizza is the ideal portion for a meal. When you’re trying to eat healthy it can be the perfect opportunity to try new toppings on your pizza. Try some interesting combinations like arugula, caramelized onion, and mushroom or chicken and basil. These combinations are healthier alternatives to the traditional pepperoni or cheese pizzas. Next time you’re on a diet it can be made a little bit better by knowing that you can eat pizza and not cheat on your health! This entry was posted in Blog and tagged New York Style Pizza, pizza on February 14, 2018 by Peter Soltesz.